"So, the kites have cutting strings coated with tiny glass shards?" I asked. Over dinner, my new Afghan friends briefed me on kite fighting, as described in the novel The Kite Runner. 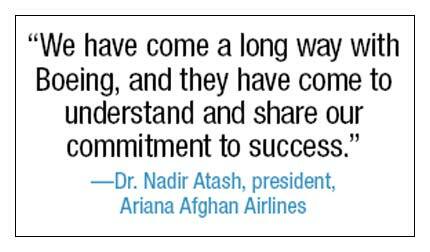 We were in Dubai, United Arab Emirates, where the Boeing sales team hosted a signing ceremony in November for Ariana Afghan Airlines, Afghanistan's national carrier. Ariana and Boeing Capital Corporation inked a deal for the lease of two 757s; the carrier also signed for the direct purchase of four 737-700s from Boeing Commercial Airplanes. Listening to Ariana's president, Dr. Nadir Atash, tell of the airline's determination to maintain operations throughout the country's many years of turmoil, it's easy to feel the tenacity and spirit of the Afghan people—which is also demonstrated in their elaborate kite-fighting tournaments that mark each spring's onset. And, while the unrest that has taken place in Afghanistan is well documented, how BCC nursed an "outside shot" into a key strategic victory and Commercial Airplanes leadership turned a prospective campaign into a lesson in leadership is also a story worth telling. "Grooming Boeing's future sales leaders is a paramount objective to ensure the company's continued success. We're constantly looking for opportunities for all the members of our sales team to grow and gain experience that will help them be successful in their careers," said Lee Monson, Commercial Airplanes vice president of Sales for the Middle East and Africa. Ariana's need for new airplanes, particularly models suited to operate from the high altitude and mountainous area around Kabul International airport, offered Monson a unique opportunity to put philosophy into practice. "At the time BCC came to us with details about the airline's needs, we were short staffed and it was still unclear how viable a campaign it might become," Monson said. Scott Scherer, BCC's vice president of Aircraft Financial Services, was determined to engage with the customer and assigned one of BCC's regional directors, Nadim Fattaleh, to arrange a meeting. Monson and Fattaleh first met with Atash at Dulles International Airport near Washington, D.C., in the summer of 2005 while waiting for connecting flights. Following that meeting, the decision was made to tap Monte Frazier, a Commercial Airplanes sales program manager, and ask that he step out of his purely sales support role and take the lead to close the deal. "There's no doubt that we faced serious challenges," Frazier said. "The airline itself was facing an image problem and struggling to overcome negative preconceptions while striving to find someone to believe in them and work toward a long-term relationship"
With slow and steady determination, and Fattaleh's drive to have BCC make the 757s available to the negotiations, Ariana and Boeing nurtured a mutual respect and understanding of what was needed to place the airplanes and ensure the airline restructuring would be successful. "It was not a question of 'if' we were going to rebuild Ariana and work towards reestablishing our profitable operations, but a question of when and how we would do so and with whom we'd partner," Atash said. "We have come a long way with Boeing and they have come to understand and share our commitment to success." Part of the commitment on Boeing's side is to provide an advanced training package to help the 757s start flight operations as quickly as possible. This includes instruction for Ariana's flight and cabin crews as well as its engineering and maintenance staff. Over the long term, the Boeing team will work to ensure training on the 737-700s, scheduled for delivery beginning in 2009. "The Ariana deal was a case that demonstrated the dedication and creativity of some of Boeing's younger talent to engage each other, as well as the customer, in finding a solution that works for all," said John Matthews, BCC's managing director for Middle East and Africa.